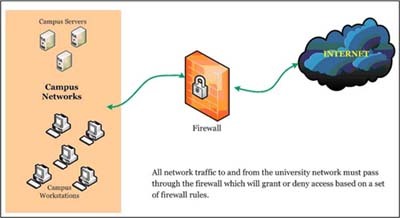 Typically, a firewall is deployed between a trusted, private network (such as UMass Dartmouth's campus network) and an untrusted public network (such as the Internet). A firewall may grant or revoke access based on a set of firewall rules. CITS reserves the right to block access to and from any host which it deems a risk to the university. Requests for access to systems or services will be handled on a case-by-case basis. Requests that are not consistent with the university's mission of academics and research will not be honored.